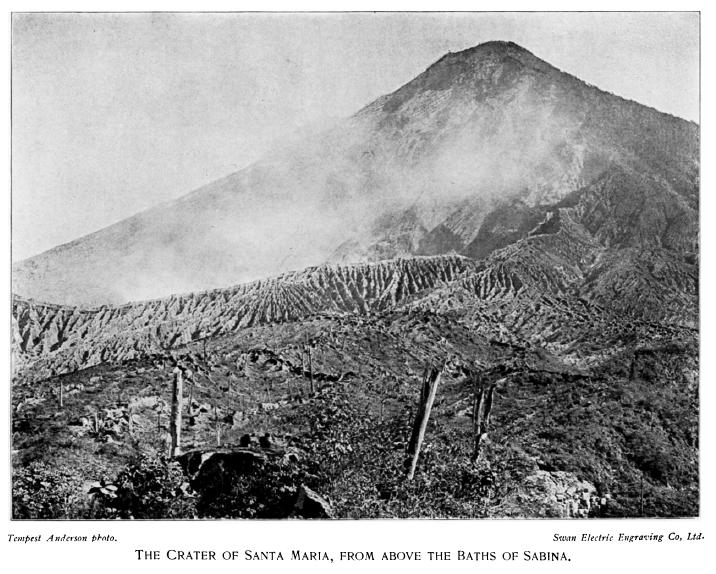 Photograph taken some time after the October 25th 1902 VEI 6 eruption of Santa Maria, Guatemala. The eruption killed more than 5,000 people as well as causing an economic disaster by destroying most of the country’s coffee crop. The eruption column reached 28 km. 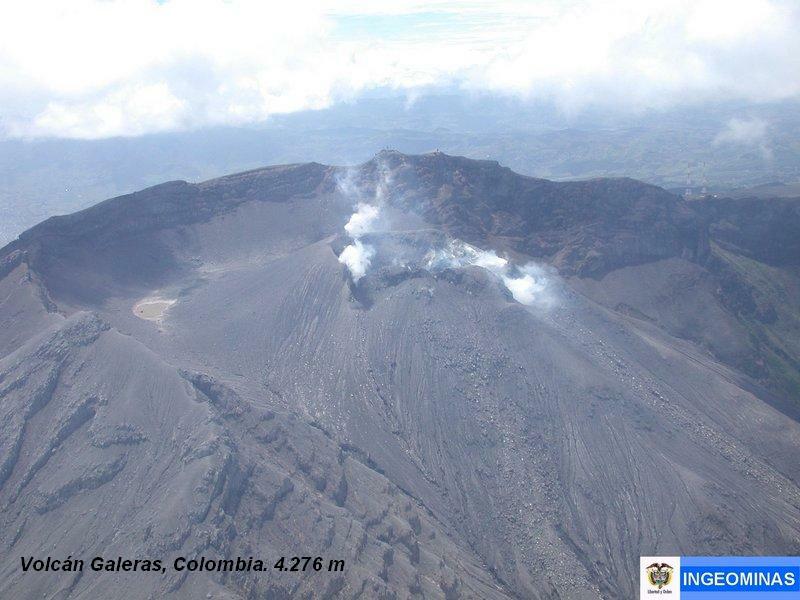 Note absence of the Santiaguito cone which has subsequently grown where the post-eruption crater used to be. This observation is statistically significant. Roughly 50% of listed volcanoes have suffered a flank collapse, often in conjunction with a lateral blast, and of those 22 volcanoes not less than 17 (or 77.3%) have done so to the westward, in the direction of the subduction zone. Is this a coincidence, does it apply only to Andean volcanoes in Equador and Columbia, or is there a general physical principle involved, a rule that applies elsewhere? Why not start a scientific project of our own in order to find out and in the process, create our own data base! So on behalf of Volcanocafé, you are hereby invited to become one of our researchers! What we want you to do is to use Google Maps (topographical is best for our purposes) or Google Earth and hunt for volcanoes that have suffered a flank collapse. Once you find one, take a screen shot – just make certain north is up! – note down its name and location, then go to the Global Volcanism Program – http://www.volcano.si.edu/search_volcano.cfm – and search for the “Volcano Number”. Does the activity that we are seeing will have any impact on the SISZ ?. I am really asking if this has reduced the stress around that area or indeed increased . I know we were waiting for that large earthquake to happen in that area. So, we leave for Iceland tomorrow morning, arrive there their morning of the 3rd. So I’m supposed to finish packing while constantly looking at the EQ data from the ridge? Sigh. I like the plots. It looks like a deep rift?? Not what I would imagine from a magma chamber. Many image hosting entities obfuscate the image with scripting to keep people from doing that. They claim it’s to protect the image owner, but someone with a little bit of knowledge about how pages are rendered can easily bypass that and snag the image itself. They are only protecting their method of profiting off of your image by forcing people to click on their site, driving up their click count and boosting what they can charge for advertising. Now… CONSTRUCTIVE criticism (not a slam by any means). It is always helpful in conveying the meaning of the data in a plot by labeling the axis and units (if applicable). Try to not leave it up to the viewer to “just figure it out” … as a rule, people viewing your plot tend to have less knowledge about what you are talking about than you do. Other than that, it’s a good plot! Thank you for your effort! Caveat: I’ve plotted lots of stuff, and been “beaten up” on more than one occasion over how I rendered the data. I am far from an expert, but I do have a few plotting endeavors under my belt. What is the significance of “…activity has occurred in pulses with two to three hours in between. “? What would cause the EQ pulses? Vatnajokull seems very quiet since the swarm at Reykjanes began, no? For you, my dear Volcanocafe friends, I have 3 new goodies. Plot wise. After searching for data, I finally found the gold mine. First is a plot of the Reykjanes ridge. I adapted the scales to really nicely show the underwater volcanic features of this region. The biggest feature is Eldey, which has a double top feature, and is the region where most of the stars are located. The swarm extends SW to the two sharper peaks. Next one, is Icelands elevation in general. It beautifully gives you the filling how complex it really is, and its formation features, and the big blob it sits on, legacy of the plume. And last is a focus on surface features. Nicely seen are the Grimsvotn caldera, Bardarbunga, Gjalp, Kverkfjoll, Esjufjoll peak, Askja outer caldera, the Pordarhyrna S of Grimsvotn and Oraefajökul. Also you can see Eya, Katla, Hekla, Vatnafjoll is nicely seen and many others across Iceland. If you want to see any particular Icelandic region, just tell me and I can zoom in. 7 MY BP, the hotspot was under what is now Langjökull, ~4-5 MY BP, it formed Hofsjökull and since at least 2 MY BP Vatnajökull. Good one Leon. Thank you. Those diagrams really explain how Iceland rift “works” and has changed and it’s relationship with the “plume” . Both have provided telling data. Very good! Now, if the casual reader will note, the RR segment has moved from it’s original “landfall” location to it’s current. Eventually, it will likely move to a new “landfall” point lying along the Westman Islands and treking up through the Hekla area. There are two possible alternatives if we speculate. The first is the MAR shifting to a line through Katla – Eyjafjallajökull – Heimey (K-E-He). The second is a much shorter shift, roughly through Hekla and Torfajökull (H-T). Seeing that there already exists a rift from Bardarbunga to Torfajökull, that Hekla is a rift feature and that the MAR at Reykjanes Ridge seems to chug along nicely, the path of least resistance would result in the H-T line opening up. How long in your best guess would this take for the MAR to shift ? Its been happening for a long time now. Quite some time. Your best estimate would probably be to compare the ages of the systems in Snæfellsnes and Reykjanes, since Snæfellsnes is where the MAR used to make landfall in Iceland. It’s been so long that I looked into it that I have forgotten the references for it. Thank you so Much Down Under. I think the visual of what lies under Rekjaynes ridge is vital to help understanding what may be going on. It certainly looks like it’s still “bubbling” under there. I may be detecting a slight slowing of the quakes but still pretty active. Your number two is… WOOT. Seriously it is giving food for though. It shows the hotspot extending in a totally unexpected direction towards Höfn. Just met the “great grandson.” Pretty weird. I spent most of the visit being drug around the house by the “tooth monster” who wanted to meet and greet everybody. I was checking for seismic data on BORG station in Iceland (IDA Network), located around 150km from the epicenters.. i did noticed a continuous recording at ~6Hz, since i dont know the station, if its common to get these recordings, or its local noise, does the IMO data corresponds to this? i´ve been mislead in the past when checking for volcanoes seismic data. Its a small amplitude recording..
Open the file with your favorite software, i recommend SeisGram2K. Only >M2 eqs will be visible on the station. Would like to know how Cotopaxi is doing while we take in this exciting Icelandic activity. I’m also taking note of how Iceland has more activity in summer. From what i gather there – report of low energy emissions rising to no more than 500 metres above the summit to the west. and continuing tremors. Seems to be bashful and hiding behind the clouds most of the time though. Should also add that it seems there’s been some ongoing activity at Reventador, with incandescent material reported on thermal images, should probably keep an eye on this one too. Very Cool! It puts the parking lot cam into perspective so that you get an idea of what the image is actually looking at! It was in a comment at Erik’s eruptions blog, and i couldn’t not share it. Honestly it’s kind of creepy to me. I keep picturing what it would be like to be standing in that parking lot looking down on the vents and not knowing when the bomb under your feet is going to go off. This is brilliant! As Lurking says it tputs the whole area into perspective. Some power being released there. If an eruption happens then is this going to be a huge flank blow out? (Makes mental note not to park car on that car park! Hakone is looking quite like Mordor today. When did that lump (inflated bit) come about? The scary part is that you can see where the doming is going on, and also see how the camera shakes now and then. My wife asked me a couple weeks back why I always had a tab open to a parking lot webcam. Waiting for it to blow up, I said. Look of disbelief, then she replied that no one’s going to car bomb an empty mall. Further explanations didn’t change that look one iota. Nobody who is not a volcanoholic themselves will ever undertand us. … well, when I met the great grandson today, I was chatting with my grandson and I was quite enthusiastic about the fact that he lives inside of the Rio Grande rift. He didn’t understand my interest. He was more stoked about finding a 4 year old can of soda in his suitcase that he had left here years ago. This isn’t the GS pic but this view made me shoot soda out my nose. The satellite view blew my mind. Wow, more gray rock, Wife says, deadpan. Two kids didn’t look up from their books (at least it wasn’t phones this time). Middle son, though. . . Patiently listened to my explanation of dikes and sills and if this ones magmatic, holy crap that must’ve been exciting. I used to think he was humoring me, but now I think he’s interested but doesn’t want me to know. 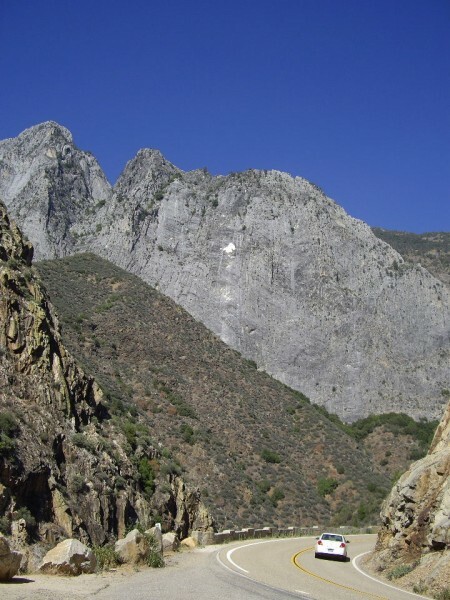 Re Kings Canyon – that place sends chills down my spine . Had to work a fire twice there . Was I very far off the mark? That airframe is used specifically to do “Hurricane Hunter” missions due to it’s ruggedness. The gray rock turned out, by the way, to be a marble roof pendant rather than anything intrusive. Impressive, still, how visible it is from above. There has got to be a paper out there somewhere discussing the role of regional tectonic stress in relation to flank collapse direction. There might be. The last “interesting” paper of that nature that I read had to do with the location of the islands in the Canarys. It seems that each one may be at an inflection point in the bend of the oceanic crust where one island loads down the crust, causing the next over island to form at a weak point in the crust. Please, great as the current plethora is to us volcanophiles, one at a time!!! Otherwise, we do not have time to explore your mysteries, present them to others and together enjoy the mighty shows you put on for our benefit. With the greatest possible respect, thank you! Emerging out of lurking mode to thank everybody rescuing the site and contributing – out of the Rift energy flows, have to expect some quakes and fountains I guess. Speaking of which, as I rearrange my bookmarks – any suggestions for Watching? How do you organize you bookmarks and windows to all the fascinating webcams, drums, maps? Lol. Being not very organised…With difficulty! I tend to group cams and plots etc together per Volcano or region. I have Icelandic, Bob.. Japan, S.America etc. Etna,…Vesuvius…Europe…Africa….NZ….But my Favs Volcano file Is HUGE! with many sub divisions so I have Iceland as a file on it’s own and of course before all these… VC. It does get messy especially when there is an eruption so I am constantly reorganising. One tip….Check links & cams weekly. They either cease working or are not as useful as an eruption subsides so I delete these. As we get more organised on our new VC site links will added under the appropriate headings at the top. The master Daleks are sorting this out as they have time. One Note….I do like to see all the Lurkers here. Please don’t be afraid of commenting even if you think nobody will be interested or that you don’t know enough. Rest assured, speaking for myself, I am way lost with some of the discussions on here.. There are some BIG brains out there but also many more average brains. All that we expect is a fascination and interest in Volcanology. I love discussing simple things such as where people live and maybe if they have ever visited or had experience of a volcano on a tourist level. Most importantly there are NO stupid questions. Nobody on here knows EVERYTHING about volcanoes and if we don’t know we all ask questions. A Lurker writes: Always watching, reading & learning, but keep myself to myself [most of the time]. Actually found Hakone drums from the closest two stations to the caldera, tho none is actually inside the caldera. But any slightly elevated activity or tremor is recorded nicely. First one is the activity around the phreatic detonation, and the second is latest. It is a one hour display. It will be interesting to follow what is going to happen there. It does not seem to follow the standard pattern for eruption for a volcano of this type. On the other hand Hakone is not a standard volcano so we will not know what will happen there. I find it interesting though the formation of the fumaroles. First a mound swells up out of the ground, then a steam explosion as a fumarole is born, then the mound sinks back down again. I would love to get instrumental inflation data for the ground in the pseudocrater of Hakone. Is that first plot live? If so, what is going on there? Its going crazy. It is slower, and we are looking for solutions. This is one of the things that comes along with having to move in a hurry when being kicked out of one’s house by squatters. Meanwhile, we are learning how to do things and we’ll get there, just bear with us. Another view of the Reykjanes ridge, this time in 3D. Gives a feeling of the underwater volcanic features. Could you link us to that plot? Also, is that amount of shaking normal? Just saw this in the news. It looks like they still arn’nt ruling out the possibility of an eruption. Rumbling at Hakone. Confirmed at Hakone caldera, based on nearby stations and arrival times. This is the closest public grid station to Hakone. It is situated just outside the caldera, where I put the orange star. I’m surprised at how much the cafe has become part of my entertainment/education/life. I have a feeling of like-minded attitudes. While this transition to a new host must have cost our Daleks a lot of time and effort, it seems to have really sparked a lot of new participation. One problem that I have though, is that I thought many of my old “friends” had disappeared but then I realized they had all taken this opportunity to change their names. Does anyone have a cross-reference of old names to new names? Well, I am me. Through some quirk of fate, I wasn’t forced into a name change. Do keep in mind, that many of the name changes were forced by the act of becoming a valid user here, and that the previous name was just rendered un-usable by the transfer to a new host, and was an unavoidable occurrence. How exactly I was able to retain my name is beyond me. It could be that I still had access to the email account that I had when I initially made my account and just requested a password reset. We do try to fix things as fast as possible. Hi. My first post here. I thought I’d join in with this project and I was scanning Sumatra on Google maps for volcanoes that have suffered a flank collapse (I started off in Chile but it’s a bit difficult to tell the difference between a deeply-eroded crater and a glacial valley, so I switched to somewhere with a more tropical climate) when I found this very strange depression. According to the Google Maps scale the diameter is about 10km. As you can see it’s just to the north of Payakumbuh (about 40km) and to the east of the Sarik-Gajah volcano. Does anyone here know what this is? Is it a volcanic caldera? Is it just a valley that happens to be approximately circular? Something else? 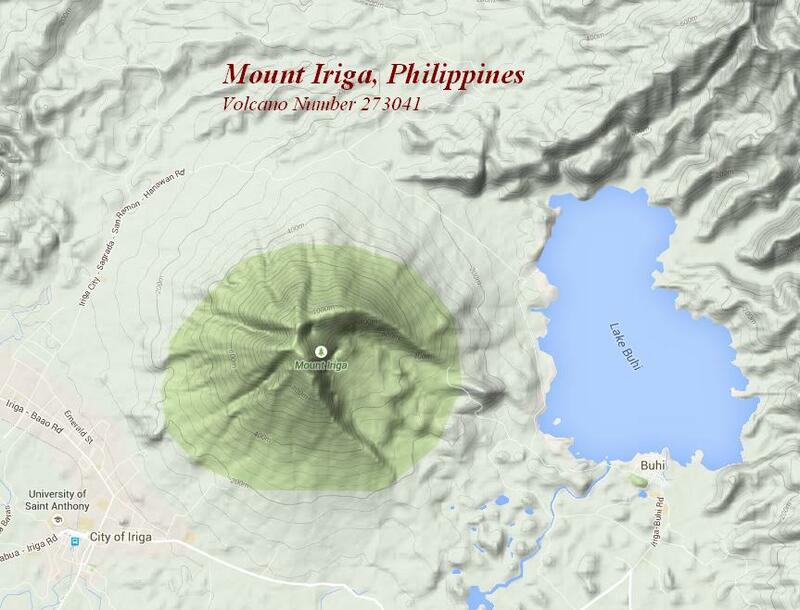 If you look at the first topographic map I posted there’s a roughly crescent-shaped hill about 1km across which sort of resembles a scoria cone down in the south-east of the depression. And north-west of that there’s a tiny cone-shaped hill. These two features are probably the most prominent things in the crater, aside from them it’s relatively flat. The hill has a scar of bare earth running down from the summit, which looks a little like a lava flow. Does anyone have any clues as to what this feature is? If it is a volcano (or was, it’s clearly not very active given that the valley floor is densely-populated and everything inside is so heavily eroded), why is there no information available about it online? Considering its size I would have thought there would be at least something on it. Download the GVP’s google earth overlay. I use it all the time – it displays all active holocene volcanoes in real-time on an interactive google earth map, which can be clicked on to provide an overview. With that said, this could very well be a very old caldera, but it also could be a tectonic or erosional feature. If you look long and hard enough, you can find a lot of areas in Indonesia that fit this criteria, especially when you go further east into the less populated islands. Part of the problem with a country like Indonesia is that they only have so much funding, so they have to allocate that funding towards the research of more recent volcanic features, and more active volcanoes. With over 75 active volcanoes, it’s difficult to justify researching what may be extinct volcanic features. And that is where we can do a bit of useful stuff. We could perhaps with a bit of luck find information to see if it is a volcano, and if it is an active volcano with a long repose period. Thanks, I really appreciate the quick reply. I’ll try to get the GVP overlay. Very interesting video, thanks Irishzombieman. I never would have believed that solid rock could do that; I guess if you’re in the right place at the right time, they kind of do! I know that wide-ranging temperature changes leads to this but it is impressive to see the rock popping violently like that. I’ve walked on small domes and slabs like this that felt hollow, like walking on a rotten log. Sorta scared of them now, after watching this. Probably a prudent feeling to have given the scenario. This last weekend, I saw one of the grandkids at a get together at my stepsons new place. He was there to see his brother who was in town from Texas. (the one that owes me photos from inside the Rio Grande Rift region)… anyway, this other grandkid, is the one who had a shocking startling experience with H2S. When younger, one Easter he had found an egg from the previous easter and it evaporated in a vigorous puff of yellow dust onto him. The shriek and his reaction are still remembered to this day. This webcam is …. interesting right now. It’s dark in Japan right now, but this webcam seems to be set to display stuff at night. Earlier today, I saw steam rising clearly here, but right now, it looks very chaotic, I can’t tell what’s going on except that there is a LOT more steam than there was before. It goes in waves. Now it looks like it did during the day. And it is also good to remember that during the night mist in the mountains form more easily, so the steam will look like more steam naturaly in the colder night air. That being said, the general trend of steam is definitely increasing. So I decided to cut together all the cotopaxi drumplots from the last month. I’ve loaded them into two pictures in order from the oldest to the newest. Worth looking at to see the changes here. I think there have been more “popper” style quakes recently, but less intensive tremor than during the middle of june. I still wouldn’t call them proper full scale poppers yet, but there definitely has been more sharp-quake followed by tremor recently. The images are quite large (long), so i didnt want to post them in here. View them at the links. Would someone be kind enough to repost the link to the Hakone car park cam? Many thanks. Thank you! I can get back to car park watching as I had lost the link. One thing worth mentioning regarding Hakone: In the last 10,000 years, it has had a lot of phreatic eruptions without magmatic eruptive sequences. I wouldn’t be entirely surprised if all that came out of this is a few phreatic eruptions as that would be fairly fitting based on its recent history. I made a comparison in real up to scale, between 4 well known volcanoes. Above are Hakone and Pinatubo – Pinakone 😀 (I dont know why I cant stop comparing those two), and below are Tambora and Cotopaxi. The baseline of Hakone is not really that much smaller than Tamboras, and the same goes for the caldera. It is a notable difference, but Hakone measures up nicely. Cotopaxi tho is smaller than those 3, but it has packed an 8km3 ejecta punch in its best times a few k years ago. Looking at Hakone, its resurgent dome is actually the size of the Pinatubo caldera. I like this. Might try this with relief maps. Cotopaxi, I think, is the oddball, being much higher overall and more prominent in its surroundings. It’d be interesting–for fun and nothing more–to superimpose Tambora’s caldera onto C’s edifice and calculate the volume above. For reference – this is a link to the last 24 hours of seismic activity of Hakone. You’ll have to translate, but it works fine once you use google translate. Seismicity has been pretty quite the last 1-2 days, but if you go back towards the end of june, it was pretty intense it seems. Tough to get a read on what is going on here. If you look back over the past month or so, seismicity is pretty interesting here. It seems there are long-ish periods of quiescence that are followed by bursts of intense seismicity. The most intense seismic period was about 3 days ago, which is around when the supposed first minor phreatic eruption occurred. Am I the only person who cannot see pictures/plots that are posted here? I can see YouTube links, but, for instance, I cannot see any of DownUnder’s graphics. 🙁 Do I have to change settings somewhere? Talla H, I can see all the graphics now, but a few days ago I couldn’t see some of them. This evening I decided it was time to update ‘adooby flash playa’ (didn’t want to write the proper name for it) as I was starting to get irritated by not being able to see – well, live streaming from webcams for example. Could it be just that updates are required? Having said that, I have actually been able to see Down Unders’ grapics before I updated – I was wondering if it was just teething problems on the new VC site. The last graphic posted by DownUnder is on a shrani.si server. If that is in an adblock program somewhere it will stop it from being displayed. The adblock that I use currently does not block it by default. If you have manually added a block on an ad hosted on that site, you may be blocking other content from it. Don’t know what the cause is. Indonesia’s volcano Raung on Java, nice picks as well …. A rumbler at or close to Hakone overnight (checked the arrival times). The Mammoth post about the proposed new Decade Volcano Program. Something to read if it rains during the weekend! I noticed that too. Is there steam rising from the summit, or are those clouds? looks like blowing snow, which I doubt. Probably clouds. One killed, five injured in an Ice Cave incident in Washington State, no Jökulhlaup involved.